This article describes the journey of the Pandavas Hastinapura to Varanavata commanded by Kuru king Dhritarashtra. This article is part of a series of articles related to narrations of journeys mentioned in Mahabharata. These travel narratives are extremely important for researchers who study about the ancient geography that existed during the period of Mahabharata. Pandavas were sent to Varanavata as a part of an evil plan of Duryodhana, the son of Kuru king Dhritarashtra. He arranged a palace for the Pandavas at Varanavata made of inflammable material. The plan was to burn the mansion while the Pandavas were asleep in it. Pandavas learned about this murder attempt with the help of Vidura and tactfully escaped from the palace. Varanavata was the ancient capital of the Kuru-forefathers. This fact is evident from a narration at Vana-Parva where it is mentioned that Hanuman considered Varanavata to be the capital of the Kurus (Mbh.3.150). Varanavata was also one among the five towns sought by the Pandavas from the Kauravas instead of half-half the kingdom, in order to avoid a war. This is mentioned in Udyoga Parva of Mahabharata at Mbh.5.31 Mbh.5.72 and Mbh.5.82. Varana-vata (Varana:- elephant; Vata:- region) means the region of elephants or where elephant-herds can be seen. Hence there should be some forest close to Varanavata where elephants can be seen and the whole of this region with the city of Varanavata and the forest near by should be on at least moderately leveled plains rather on high Himalayan mountains. From the narrations in Mahabharata, the location of Varanavata is found to be somewhere around Haridwar and Rishikesh towns in Uttarakhand. Other candidate locations of Varanavata include a the town in Uttar_Pradesh named Barnava and one in Uttarakhand in high Himalayas, named Lakhamandal. Shivpuri close to Rishikesh and Uttarkashi too are considered. Uttarkashi is in high Himalayas (1158 m above sea level; 176 km upstream from Haridwar) and somewhat match with the description of Varanavata in Mahabharata. Uttarakashi town lies on the southern foothills of a mountain named Varunavat Parvat. The similarity of the name is striking. If Varanavata happens to be a corruption of Varunavata, then the etymology relating it to Varana (elephants) will be unnecessary. It is unclear if it is possible to reach this place in chariots. Uttarkashi lies on the banks of Ganga, strictly speaking, on the banks of river Bhagirathi. The name Ganga is applied to Bhagirati only after it reaches Devaprayag where it is joined by Alakananda river. Uttarakashi is also a place sacred to Siva. Hence Uttarakashi cannot be ignored as a candidate location for Varanavata. Lakhamandal is on the banks of Yamuna rather than on the banks of Ganga. 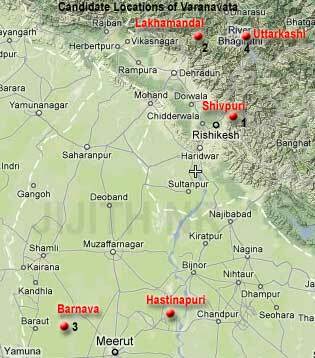 Barnawa is in the plains but towards the east of Hastinapura and close to Yamuna. The narrations in Mahabharata indicates that Varanavata was close to river Ganga and it was possible to reach this place in chariots. This rules out all places on the banks of Yamuna and all places which are too high on Himalayan mountains. The most probable location for Varanavata where the Lakshagraha (house of inflammable materials) was built seems to be the one close to Rishikesh. The place now known as Barnava need not be discarded as a candidate-location for Varanavata. It seems to be another Varanavata (where elephants can be seen, or where wild-elephants were trained for inducting as war-elephants in the army). This place could be the Varanavata listed in the five towns sought by Yudhisthira. Because, other towns in the list as well as this Varanavata (Barnava) were close to Indraprastha (Delhi) where Yudhisthira formerly ruled. Interestingly Hastina-pura (Hastin, Hasti:- elephant; Pura:- city) too was a city named after elephants and hence in a sense another Varanavata. The whole region seems to be in a belt where elephants can be seen. This is especially true from the perspective of a tribe (the Kuru tribe) who migrated from Saraswati in the west towards Ganga in the east, or from Tibet in the north to the Gangatic plain in the south. The son of Suvala Sakuni, king Duryodhana, Duhsasana and Kama, in consultation with one another, formed an evil conspiracy. With the sanction of Dhritarashtra, the king of the Kurus, they resolved to burn to death Kunti and her five sons. But that wise Vidura, ascertained the intention of these wicked persons. Then the sinless Vidura, came to the conclusion that Kunti with her children should fly away from her foes. And providing for that purpose a boat strong enough to withstand both wind and wave, he addressed Kunti and said, This Dhritarashtra hath been born for destroying the fame and offspring of the Kuru race. Of wicked soul, he is about to cast off eternal virtue. O blessed one, I have kept ready on the stream a boat capable of withstanding both wind and wave. Escape by it with thy children from the net that death hath spread around you' Vaisampayana continued, Hearing these words, the illustrious Kunti was deeply grieved, and with her children, stepped into the boat and went over the Ganges. Then leaving the boat according to the advice of Vidura, the Pandavas took with them the wealth that had been given to them while at Varanavata by their enemies and safely entered the deep woods. In the house of lac, however, that had been prepared for the destruction of the Pandavas, an innocent Nishada woman who had come there for some purpose, was, with her children burnt to death. And that worst of Mlechchhas, the wretched Purochana who was the architect employed in building the house of lac was also burnt in the conflagration. And thus were the sons of Dhirtarashtra with their counsellors deceived in their expectations. And thus also were the illustrious Pandavas, by the advice of Vidura, saved with their mother. But the people of Varanavata knew not of their safety. And the citizens of Varanavata, seeing the house of lac consumed and believing the Pandavas to have been burnt to death became exceedingly sorry. And they sent messengers unto king Dhritarashtra to represent everything that had happened. And they said to the monarch, Thy great end hath been achieved! Thou hast at last burnt the Pandavas to death! Thy desire fulfilled, enjoy with thy children. O king of the Kurus, the kingdom' . From the above narration we understand that the palace for the Pandavas (Lakshagriha. the house of lac and other inflammable materials) was built close to a stream, where there were swift currents. The stream mentioned here could be a tributary of Ganga or Ganga itself near Haridwar or Rishikesh. The subsequent nine chapters (144 to 152), gives a detailed narration of the incident. In this narration we see that the Pandavas are being exiled to Varanavata, by Drhitarashtra at the behest of Duryodhana who was jealous of them because people favored Yudhisthira as their next king. The city of Varanavata is described thus:- The festival of Pasupati Siva hath commenced in the town of Varanavata. The concourse of people is great and the procession is the most delightful of all ever witnessed on earth. Decked with every ornament, it charmed the hearts of all spectators'. This town was delightful and populous. The Pandavas, having performed propitiatory rites for obtaining their share of the kingdom, and finishing their preparations, set out for Varanavata (Mbh.1.145). Varanavata was thus a populous town famous for the festival of Pasupati, Siva. (Mbh.1.146):-After ensuring that the Pandavas will leave for Varnavata, Duryodhana instructed Purochana to construct an inflammable palace for them at Varanavata:- The Pandavas have, by Dhritarashtra, been sent to Varanavata, where they will, at Dhritarashtra's command, enjoy themselves during the festivities. Do that by which thou mayest this very day reach Varanavata in a car drawn by swift mules. Repairing thither, cause thou to be erected a quadrangular palace in the neighbourhood of the arsenal, rich in the materials and furniture, and guard thou the mansion well with prying eyes. And use thou in erecting that house hemp and resin and all other inflammable materials that are procurable. And mixing a little earth with clarified butter and oil and fat and a large quantity of lac, make thou a plaster for lining the walls, and scatter thou all around that house hemp and oil and clarified butter and lac and wood in such a way that the Pandavas, or any others, may not, even with scrutiny behold them there or conclude the house to be an inflammable one. And having erected such mansion, cause thou the Pandavas, after worshipping them with great reverence, to dwell in it with Kunti and all their friends. And place thou there seats and conveyances and beds, all of the best workmanship, for the Pandavas, so that Dhritarashtra may have no reason to complain. Thou must also so manage it all that none of Varanavata may know anything till the end we have in view is accomplished. And assuring thyself that the Pandavas are sleeping within in confidence and without fear, thou must then set fire to that mansion beginning at the outer door. The Pandavas thereupon must be burnt to death, but the people will say that they have been burnt in an accidental conflagration of their house. Saying, So be it' unto the Kuru prince, Purochana repaired to Varanavata in a car drawn by fleet mules. (Mbh.1.147):- Meanwhile the Pandavas got into their cars (chariots), yoking thereto some fine horses endued with the speed of wind. The Pandavas, ever mindful of their vows, set out for Varanavata. Apart from the details on what are the inflammable materials used to build the house of lac, this narration also gives us a hint that the town of Varanavata is reachable in a chariot. Thus Varanavata should be situated in a plain like Hastinapura, and not in a mountainous terrain inaccessible to chariots. (Mbh.1.147):- The Pandavas set out on the eighth day of the month of Phalguna when the star Rohini was in the ascendant, and arriving at Varanavata they beheld the town and the people. (Mbh.1.148):- The citizens of Varanavata on hearing that the son of Pandu had come, were filled with joy at the tidings, speedily came out of Varanavata, in vehicles of various kinds numbering by thousands, taking with them every auspicious article as directed by the Sastras, for receiving those foremost of men. And the people of Varanavata, approaching the sons of Kunti blessed them by uttering the Jaya and stood surrounding them. And those sinless ones, welcomed by the citizens and welcoming the citizens in return, then entered the populous town of Varanavata decked with every ornament. Entering the town those heroes first went, O monarch, to the abodes of Brahmanas engaged in their proper duties. Those foremost of men then went to the abodes of the officials of the town, and then of the Sutas and the Vaisyas and then to those of even the Sudras, thus adored by the citizens, the Pandavas at last went with Purochana going before them, to the palace that had been built for them, Purochana then began to place before them food and drink and beds and carpets, all of the first and most agreeable order. The Pandavas attired in costly robes, continued to live there, adored by Purochana and the people having their homes in Varanavata. After the Pandavas had thus lived for ten nights, Purochana spoke to them of the mansion he had built called The Blessed Home' but in reality the cursed house. Then those tigers among men, attired in costly dress, entered that mansion at the instance of Purochana. This passage again indicates the population of Varanavata. It was a large town, (for a town in 3000 BCE time periods) containing more than 1000 (perhaps 5000) inhabitants. The use of vehicles by the inhabitants also indicate a level ground rather than a mountainous terrain. The passage also indicate that the palace for the Pandavas were not ready when the Pandavas reached the town and took ten more days for completion. The Pandavas stayed in a temporary house arranged by Purochana and entered the house once it was complete. It will also be difficult for Purochana to build the said house as instructed by Duryodhana somewhere in the high Himalayan mountains in the stipulated time. Vidura sent to Pandavas a miner who created for them a tunnel (subterranean passage) with its one mouth in the center of the palace-house and the other mouth close to river Ganga. From the narrations in Mahabharata we learn that the Pandavas lived for a full one year in the house while the subterranean passage was being built in secrecy. The tunnel was completed probably in less than a years time. Assuming that 3 to 4 meters of tunnel is dug on a day, starting from the shores of Ganga towards the palace, it will take less than a year to build a 2 kilometer long tunnel. On a certain night, Bhima set fire to the palace and the Pandavas escaped through the subterranean passage. The wicked Purochana and an innocent family of Nishadas who were then sleeping in the house were burned to death. A boat-man sent by Vidura saw the Pandavas as they emerged out of the tunnel close to the banks of river Ganga. The Pandavas were then trying to measure the depth of the river to cross it and reach the other side. (Mbh.1.151):- Sent by Vidura unto them, he showed the Pandavas on the sacred banks of the Ganga a boat with engines and flags, constructed by trusted artificers and capable of withstanding wind and wave and endued with the speed of the tempest or of thought. The boat-man safely ferried the Pandavas and their mother to the opposite bank of the river:- Having taken them over the water and seen them all safe on the opposite bank, he uttered the word Jaya' (victory) to their success and then left them and returned to the place whence he had come. (Mbh.1.152):- They then speedily reached the opposite bank aided by the strength of the boatmen's arms, the rapidity of the river's current, and a favourable wind. Leaving the boat, they proceeded in the southern direction finding their way in the dark by the light of the stars. After much suffering they at last reached, a dense forest. They were then tired and thirsty; sleep was closing their eyes every moment. The narrations indicates that the Pandavas reached a dense forest in the same night on which they set the house to fire. They reached the forest after crossing river Ganga and moving in a southern direction, guided by the stars in the night sky. This indicate that the house of lac (Lakshagriha) was situated in the other side of the river, on a slightly elevated terrain from where a tunnel is built underground opening to the shore of Ganga. The rapidity of the river's current which in favor of crossing the river to reach the opposite bank indicates a curve in the river flow. Considering the tunnel to be 2 km long and the trip in boat to be 2 km long and the journey into the dense forest to be 4 or 5 km long, Pandavas could have reached the forest in three or four hours of time at mid night. Then they felt thirsty and sleep was closing their eyes every moment. The southern path that they traversed seems to be the road leading to Hastinapura, from where they diverted after short distance to enter into the forest. 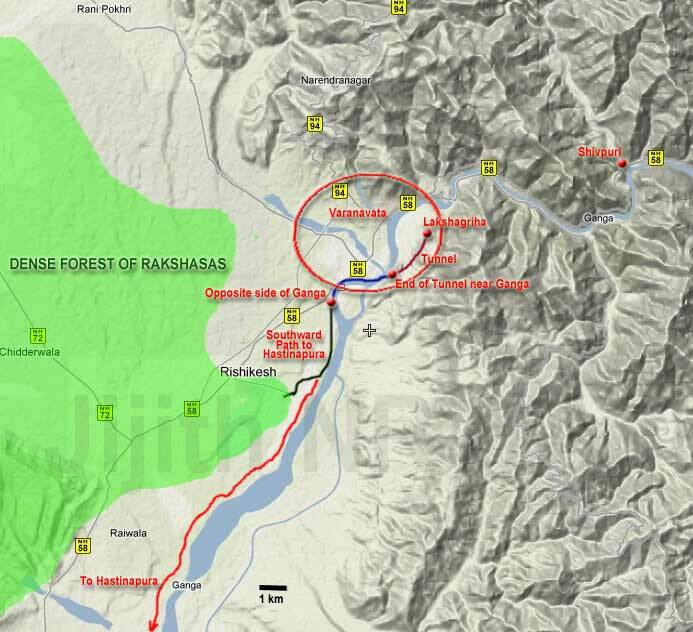 The subsequent passages mentions that this forest was within the territory of Rakshasas like Hidimba.